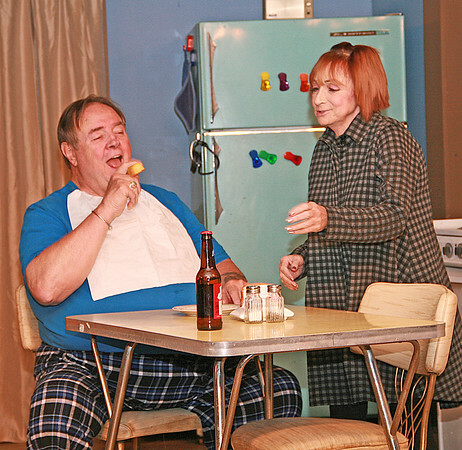 HOME GAMES: John Carver and Kristen Wilson star in Center Stage Community Theatre's presentation of "Home Games," the final production of the 2017 season. The comedy tells the story of a woman, her father, a blind cat and an ill canary as they deal with dementia, the 1955 Yankees and new love. The play will debut at Center Stage, 604 Powell St., tomorrow at 7:30 p.m. and show on Fridays and Saturdays at 7:30 p.m. and Sundays at 2:30 p.m. through Nov. 6. Tickets are $15 for adults and $13 for adults and students. To reserve tickets, call 765-894-5587 or go online to http://www.brownpapertickets.com.